I took the new Vepr AK out to the range for a basic checkout and zero. Using the standard Wolf 122gr HP ammo and the iron sights, with the rear sight set at the 200 meter increment the gun was 1 inch high at 25 yards and slightly left. Cranked in 4 clicks right windage on the rear sight (very easy to use, am going to have to see if it’s available as an accessory for other AKs!) and it was dead on for windage. At 100 yards, group center was 8 inches high with the 200 meter setting on the tangent rear sight. The group measured 2 inches (!) with the entirety of its’ spread being laterally, which is obviously a sign of my problem using the rather large U-shaped notch on the rear sight. I didn’t use sandbags, just put the gun over my shooting bag. Changing to the 100 meter increment, the gun was dead-on at 25 yards, and 3 inches high at 100. I’m not going to tinker with the front sight to change the elevation, just going to leave well enough alone! Using the 100 meter setting I should be able to hold dead-on at any range out to about 150 meters, then switch to the 200 meter setting and rock on. The group fired at 100 yards was just under 3 inches (got in a hurry! ), again with ALL of the spread being horizontal. The vertical dispersion was just about one inch, with 2 rounds of the 3 touching. The trigger is obviously good enough. I would say that if I put it on sandbags, then took my time with the sights it should go into under 2 inches using only the iron sights quite handily. I’m going to be curious to see what it does when I get a scope mounted, not for fulltime use but just to see what it can do. I mounted the Kobra red-dot and tried it out, but found it lacking sufficient adjustment for zero to allow me to get it aligned with this gun. According to the book that came with it, it does have a means by which to crank in more, but didn’t have time to fiddle with it and try that out. I wasn’t that impressed with the lever on the mount, either, which popped off of its’ post and required rather more care than something mil-spec (?) should need. The position of the sight and such should make it handy, IF I can assure myself that it stays on the gun well and that it can be zeroed properly. We’ll see. The gun is very nice, albeit slightly heavy for an AK, but it most certainly does live up to its’ billing for accuracy! This carbine is developed from the RPK-74 light machine gun. It differs from the RPK-74 in caliber, cartridge, mode of fire, magazine capacity, design and dimensions. These new production rifles from Russia feature injection molded nylon furniture, a RPK style receiver, chrome lined forged barrel and scope rail on the left side of the receiver. The Russian VEPR is a hunting rifle designed after the AK Rifle and built upon a RPK receiver. The rifle also comes in four different calibers .308, 7.62×39, .223 and 5.45×39. The VEPR rifle has the same reliability as an AK allowing it to work at temperatures of -50 to +50 C and in any conditions. However the rifle also has accuracy, allowing it to obtain scores of 92 points out of 100 at 200 yards. Although the VEPR is billed as a hunting rifle, it takes all of the available high capacity magazines including drums. The receivers and other major components are manufactured in Russia and then shipped to Robinson Arms who assembles them and adds high quality American made parts to comply with ATF regulations. Because it uses the required number of American parts, surplus foreign made magazines can be used The resulting rifle is regarded by many as the best-stamped receiver AK-47 variant currently available. There are three basic types of Kalashnikov rifles on the market. They are the AK47, AKM47, and the RPK (heavy duty receiver). As most of you know, the AK47 was designed as an infantry rifle capable of firing in either the semi-automatic or fully-automatic mode. The first AK47s had machined receivers. Later the Soviets produced the AKM47s (the “M” stands for modern). The Soviets found that stampings were not only more efficient to produce but resulted in longer receiver life and better accuracy than the milled receivers. The RPK, on the other hand, was designed as a squad automatic weapon. 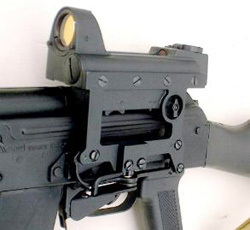 The RPK could also be fired in either semi or fully-automatic modes. Squad automatic weapons, as deployed, are more frequently fired in the fully automatic mode. For this reason, one usually sees the RPK pictured with an ultra-high capacity magazine such as a 75 round drum or 40 round box magazine instead of the standard 30 round magazine typically used with the AK. To handle the sustained automatic fire, the RPK was designed to be much stronger. First, the sheet metal of the receiver of the RPK is 50% thicker than that of the AKM47. Next, the trunion of the RPK is larger and stronger than that of the AK47 or AKM47. The trunion is the part to which the barrel is connected and into which the bolt locks. Because the trunion is larger, the receiver must be bulged out to accept the larger trunion. Hence the above mentioned bulges on the RPK receiver. Most of the MAK90s, WUMs, Maddis, MISR, etc. are semi-automatic sporting rifles based on the AKM47. On the other hand, the VEPR is based on the RPK. This stiffer receiver makes for better accuracy and longer life.